Each neighborhood has its own unique history of development, from farmland, woods, or even marsh to streets filled with two-bedroom bungalows or elaborate Victorian mansions. North, south, east or west, Muncie’s neighborhoods are no different, each unique in character and filled with the hopes and dreams of its residents. Last weekend, a small group of residents gathered together to lift the hopes and dreams of McKinley neighborhood residents through beautification efforts that painted boarded windows and doors and cleaned trash and debris from two abandoned homes located on North Mulberry St. 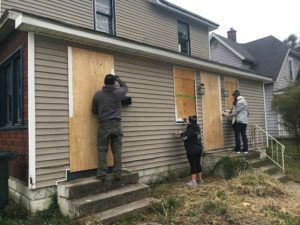 Volunteers Aimee Robertson-Fant, Kyle Johson, and Augusta Wray work to cover plywood securing the abandoned home at 710 N. Mulberry St. Responding to the recent cleanup efforts organized by City of Muncie departments, including the Muncie Police Department, Muncie Sanitary District, and Building Commissioner’s office, amongst others, Muncie Delaware Clean and Beautiful put a call out on Thursday morning for volunteers. 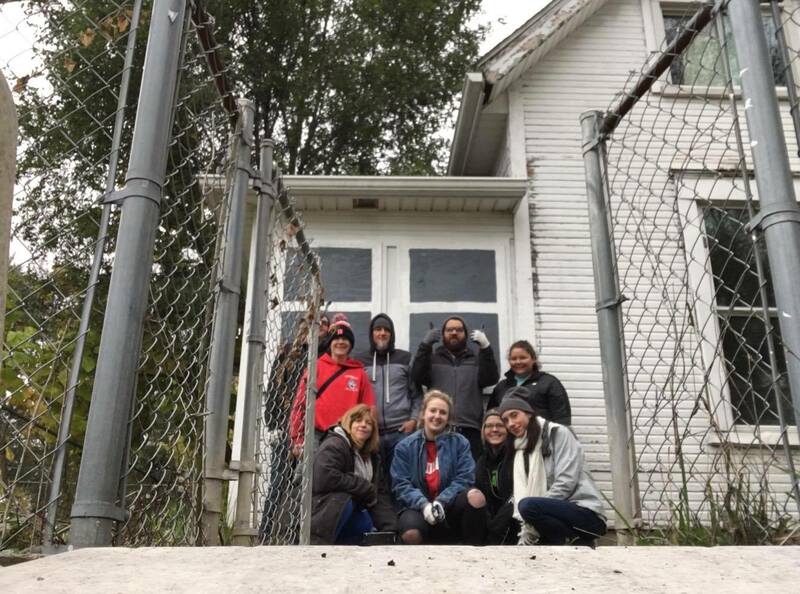 Partnering with the Muncie Action Plan and Ball State’s Building Better Neighborhoods program, Muncie Delaware Clean and Beautiful set up their trailer on Mulberry Street on Sunday afternoon and directed volunteers in painting boards and cleaning up years of discarded debris. Muncie Police Department officer Mike Mueller, who helped spearhead the city-wide cleanup of the neighborhood that inspired Sunday’s efforts, understands the importance of this neighborhood as it is directly across from the city’s only high school and on a major thoroughfare for visitors and residents traveling to and from Muncie’s downtown. 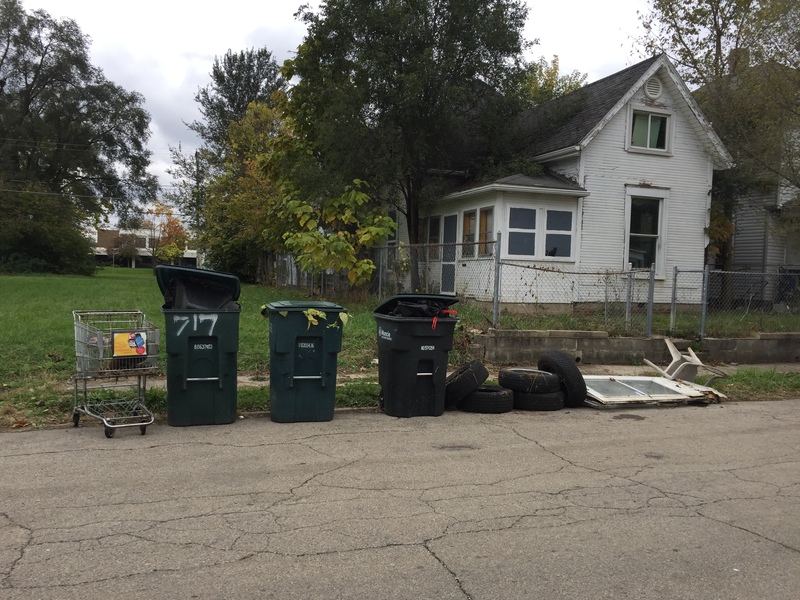 Mueller believes all parties interested in neighborhood revitalization may be able to work together at similar cleanups in neighborhoods throughout the city, hopefully beginning again in 2018. 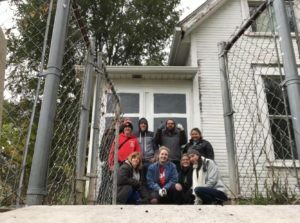 Trash and debris was cleaned and windows boarded at 741 N. Mulberry St.
Ball State Immersive Learning students, under the direction of faculty member Lisa Dunaway, worked alongside residents in spring 2017 to develop a combined Minnetrista and McKinley Neighborhood Action Plan. This document may serve as a guide for resident-driven revitalization efforts. On Nov. 28th at 6pm, come to a community meeting to discuss the future of the McKinley neighborhood. Building Better Neighborhoods and MAP will host the meeting at Muncie Central and encourage the participation of residents and businesses. Attendees will be invited to participate in the 100 Stories and 100 Dreams for Abandoned Properties project. 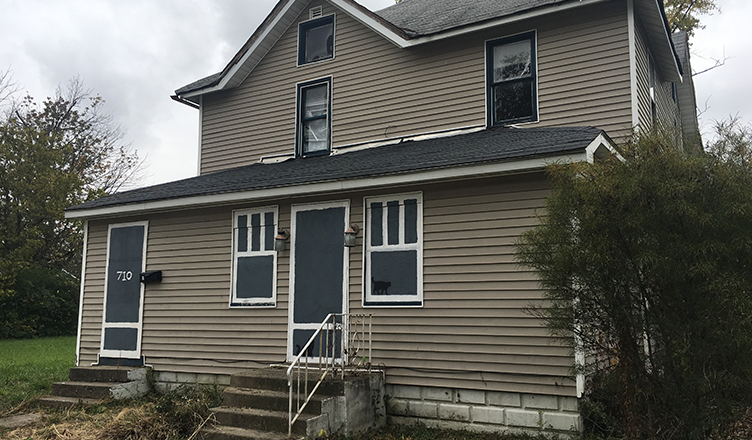 The aim is to collect as many stories about and ideas for blighted properties as possible, as part of a city-wide effort to address blight by creating a new land bank. Urban Planning Professor John H. West will be on hand to talk with and collect stories.